Mumbai's traffic can be horrendously slow. I have often wondered how much of India's GDP is actually stuck in traffic jams on streets and highways across the country. 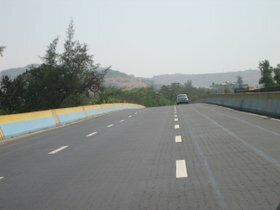 On a recent trip to Pune, I was pleasantly surprised by the (relatively) new Mumbai-Pune Highway. The 95 km stretch used to take over 3 hours and now the journey can be completed in less than an hour and half. We cruised down to Pune on a six lane highway at 100 km an hour, passing by scenic mountains and valleys. The traff ic is light on the highway since the Rs 680 toll (almost $15) is considered too high by many commercial transportation companies who prefer to use the old slower route. For cars, the toll is Rs 118 (approx $2.50) which is more reasonable. I believe we are in early stages of the adoption curve for toll roads in India. 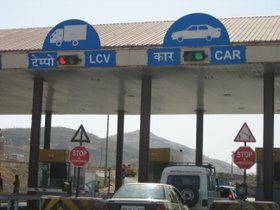 Over the next decade, these toll roads will be a huge revenue generator for the BOT (Build, Operate and Transfer) operators in India. After many delays, India is making real progress in creating a world class national highway system connecting four major cities (Mumbai, Delhi, Kolkata and Chennai). It's called the Golden Quadrilateral and is scheduled for completion in December 2006. Here's a good entry on it in wikipedia. Great blog - thanks for sharing!